Successfully Added 3 Port USB Car Charger - Two 2Amp USB， One 1Amp USB，Holds Most Phones to your Shopping Cart. 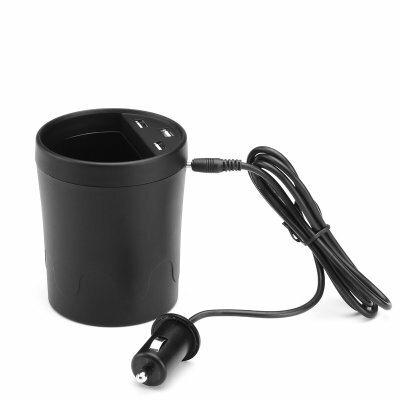 This 3 port USB car charger is designed to sit snugly in your cars cup holder and with split partitions can keep you phone’s safe as well as provide storage for pens and spare change that would normally be rattling around in the center consol. Measuring about 7 CM across the cup style USB charger can hold most smart phones such as slim iPhone 6 with its 5 inch screen. The 150CM cable is plenty long enough to reach the lighter / charging port in your car and offers enough power for multiple devices to charge simultaneously. With Two 2 Amp and one 1 Amp USB output ports you can keep every charged and organized while on the road. This car USB Charger is brought to you by the leader in electronic devices as well as wholesale car accessories..